Pro artists help you improve your manga art, plus we take a look at the promo art for hit series Stranger Things. Manga is a deceptively simple art form that takes skill to master. Luckily, pro artists Ilya Kuvshinov and Genzoman are on hand to help boost your manga skills. In his workshop, Ilya reveals how he painted our cover character on the fly, while remaining true to the manga aesthetic. Meanwhile, the Wild West is Genzoman’s inspiration for his manga mashup, set in a saloon bar packed with interesting-looking characters. 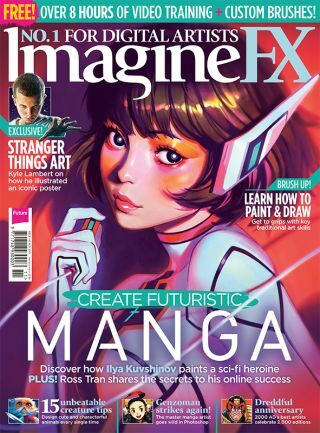 Get issue 140 of ImagineFX here! Elsewhere in this packed issue, we talk to Ross Tran about his rising popularity, thanks in no small part to his fun-packed YouTube channel. We also get Noukah’s advice on painting creatures with a strong personality and see how Valentina Remenar puts a spin on the cyberpunk genre, while Kyle Lambert explains his thinking behind the promo art for Stranger Things, the hit series from Netflix. There’s also a packed Q&A section, tackling topics such as underwater lighting, expressive hands, and how to beat artist’s block? We chart the success of British comic 2000 AD, home of Judge Dredd, Rogue Trooper and Tharg the Mighty, as it reaches its 2,000th issue. Discover how The Sequence Group, a studio based in Canada and more recently Australia, likes to build up its artists’ skills on the job. We find out if the latest version of Painter succeeds in bringing new tools to the table, while avoiding the symptoms of software bloat. A new traditional art series on plein air painting starts by looking at the advantages of using gouache to paint in the great outdoors. There are also eight hours of pro videos, custom brushes, WIPs and final art, which you can get hold of on our dedicated download page – details in the issue.